About 2 oz. WW white yarn. Row 6: Sc in each sc across, ch 1, turn. Rows 8 - 15: Sc in each sc across, ch 1, turn. Rows 17 & 18: Sc in each sc across, ch 1 turn. Work color changes as stated in each row. Carry white yarn under pink. Row 20: W- Sc in next 4 sc, P- Sc in next sc, W- sc in next 4 sc, ch 1, turn. Row 21: W- Sc in next 3 sc, P- sc in next 3 sc, W- Sc in next 3 sc, ch 1, turn. Rows 22 - 25: W- Sc in next 2 sc, P- sc in next 5 sc, W- sc in next 2 sc, ch 1, turn. Row 27: W- Sc in next 2 sc, P- sc in next 3 sc, W- sc in next 2 sc, ch 1, turn. Row 29: W- Sc in next 2 sc, P- sc in next sc, W- sc in next 2 sc, ch 1 turn. Break off pink yarn and continue with white yarn only. Row 30: Sc in each sc across, ch 1, turn. Rows 32 - 46: Sc in each sc across, at the end of row 46, fasten off. Rows 20 - 46: Repeat as for First Ear Strap. Sew the end of row 46 of both straps together. edge of purse down and up to the opposite edge of row 18, sl st in same place as last sc worked, fasten off. Rows 1 -18: Work as for front pattern. Rows 20 - 25: Sc in each sc across, ch 1, turn. Row 27: Sc in each sc across, ch 1, turn. Rows 29 - 31: Sc in each sc across, ch 1, turn. Row 33 - 46: Sc in each sc across, at the end of row 46, fasten off. With wrong sides together, sl st purse together over the sc of the trim, matching up the sts. Fasten off. Row 4: Sc in each sc across, fasten off. Sew nose as desired on face (front of purse), embroider mouth under nose. Glue eyes over nose, or embroider eyes over nose if desired. 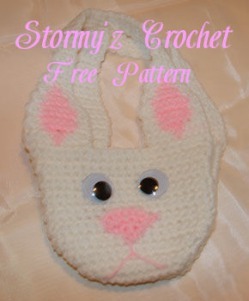 Copyright 2007 Stormy'z Crochet. Do not sell patterns to others claim as your own. You may sell items you make with this pattern at craft fairs and to family and friends, but do not sell items on the internet without prior permission.